Just after Vodafone announced its partnership with HMD Global to provide special offers on purchase of Nokia 3, 5 and 6 smartphones in India, Xiaomi and Reliance Jio have now struck a similar deal. Xiaomi users can get additional 4G data up to 30GB from Reliance Jio on every recharge of Rs 309 or above. However, there are some fine prints attached to the deal. First of all, this “up to 30GB” data essentially means that, till March 31, 2018. Mi users are allowed a total of six recharge, each of which will offer an additional 5GB of 4G data, which will be activated in a user’s account within 48 hours. Basically, it is not a collective 30GB that you get, but an opportunity to get additional 5GB data six times in this financial year till March 2018. Also, to be eligible for this offer the services of Reliance Jio must have been activated for the first time on or after 16 June 2017. Which means the recharge will be effective for the offer if it is done after the mentioned date. 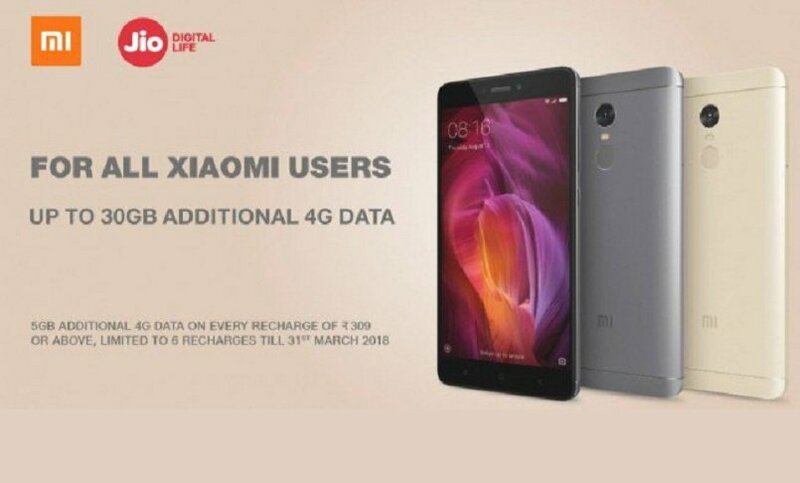 Do note, “any additional data voucher redeemed during a recharge cycle period, the benefits attached to such additional data voucher shall be limited to that Recharge cycle period and any such benefits that remain unutilized at end of that Recharge cycle period, will expire and be forfeited,” Xiaomi mentioned on its blog. Additionally, on the Mi blog, the terms and conditions of this offer state that, an “Eligible Subscriber” shall mean a person who purchases one of the Eligible Device (listed below) and who is an active subscriber of the Reliance Jio connection (both existing or new). The customer should also be enrolled to the Jio Prime membership plan. For the ones who avail this offer, two or more offers cannot be clubbed together, and it cannot be used in conjunction with any other alternative offer or promotion of a similar nature. However, you will continue to avail the benefits under Jio Dhan Dhana Dhan, till such time that it is available. Further, this offer is applicable on only 15 Xiaomi devices, namely, the Xiaomi Redmi 2, Xiaomi Redmi 2 Prime, Xiaomi Redmi Note 4G, Xiaomi Redmi Note 4G Prime, Xiaomi Mi 4i, Xiaomi Redmi Note 3, Xiaomi Mi 5, Xiaomi Mi Max, Xiaomi Mi Max Prime, Xiaomi Redmi 3s, Xiaomi Redmi 3s Plus, Xiaomi Redmi 3s Prime, Xiaomi Redmi Note 4, Xiaomi Redmi 4A, and the Xiaomi Redmi 4. And if you try to cheat and migrate from the eligible device to any other device, the offer benefits shall be discontinued. Essentially, on the basis of the record IMEI numbers of eligible devices only will the offer be applicable.